Anything and everything to do with the Barwon River. Today, Bell Post Hill is a suburb of Geelong and the home of Kardinia International College, a non-denominational private school which caters for students from Kindergarten to year 12, however things were once very different. 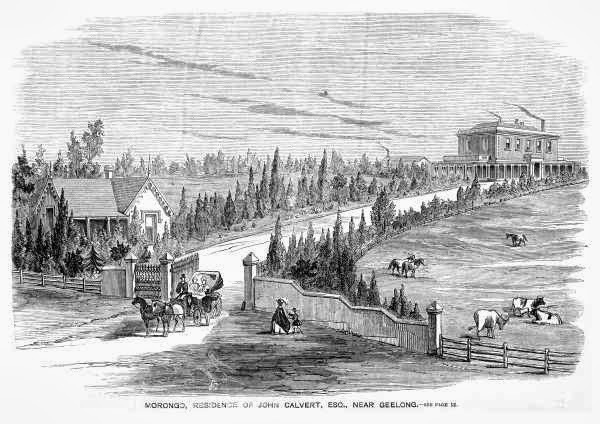 In March, 1836, it became the site of one of the very earliest squatting runs in the Port Phillip district when John Anthony Cowie and David Vere Stead moved into the district. The pair had arrived from Tasmania in November the previous year with John Batman's party of settlers. The only other settler in the district at that time was Dr Alexander Thomson who arrived some two months after Cowie and Stead and settled on the south bank of the Barwon at the future site of the suburb of Belmont, Geelong. On 9th July, 1836 John von Steiglitz (recently married to Cowie's sister Emma) arrived at Point Henry with stock for the run which they continued to build on for the next few years. The land held by Stead, Cowie and Steiglitz as their grazing run extended from Bell Post Hill down to the Moorabool River near Batesford and north towards what is now Lara - known to the early settlers as Duck Ponds. Popular legend has it that Bell Post Hill was named for a bell, erected on the high point of the hill (possibly an old ship's bell brought by Cowie and Stead) which was used to notify settlers of the arrival of ships approaching Point Henry and also of imminent attacks by hostile members of a no doubt displaced indigenous population. Cowie, Stead and the von Steiglitz brothers did not long remain in the district and by 1838 they had moved up the Moorabool River where they took up a number of runs which will be the subject of future posts. 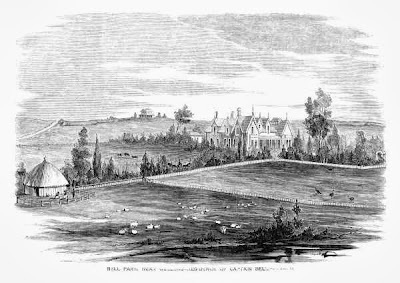 Being close to the newly established town of Geelong, the original Bell Post Hill run was soon divided up for closer settlement - possibly a reason for the departure of Cowie & Co. By 1852 subdivision was occurring in the area of Cowies Creek and by the 1860s it boasted a population of about 500 people and two pubs. Land at Bell Post Hill on the Bates Ford Road was being auctioned in lots upwards of an acre by 1853. During 1859-60, John Calvert Esq who then owned land at the top of the hill, had a grand house erected which he called "Morongo". In addition to this residence, Calvert had squatting interests in the Western District holding the Irrewarra and Watch Hill runs with Captain John Bell who was also his neighbour at Bell Post Hill, having built his own mansion - "Bell Park" - only a short distance from Calvert's residence some years earlier in 1853-1854. All that remains of "Bell Park" today is an extension to the house, added in 1860 which now serves as a chapel for the McKellar Centre owned by Barwon Health. "Morongo" however, still survives. Following the death of Calvert in 1869 the property was advertised for auction. In 1884 with Mr Everingham as its current occupant the property, including the house and 100 acres of land, was advertised for lease. It was again advertised for lease in 1895, this time with Mrs James Bell the occupant. In 1921 Senator James Francis Guthrie purchased "Morongo". The senator was active in the wool trade in both Geelong and Melbourne and was largely responsible for establishing the Corriedale breed of sheep in Australia. Further biographical details for Senator Guthrie can be found in the Australian Dictionary of Biography. After only five years in residence, Guthrie sold the property in October, 1926 to the Presbyterian Church. The church then established the Morongo Girls College which opened its doors in 1927. It is said that the old bell used by Cowie and Stead which had been discarded but later found and retrieved from the Moorabool River by a fisherman, became the school bell which was used for the next 26 years until it was stolen in 1953. An article appealing for information was published in the Argus. The school itself operated until 1994 when its doors closed for the final time. The following year, Mr Yoshimaro Katsumata, a Japanese businessman purchased the school which opened at the beginning of 1996 as Kardinia International College. Today the school boasts some 1,700 students across all year levels. The "Morongo" homestead survives as one of the school buildings and one side of the driveway would appear to be lined with the trees planted during Calvert's time and which appear as saplings in the sketch of the homestead. Regarding the gates to Morongo off Ballarat Road, they were pulled down and reassembled on their current site around 2008 or so to make way for the Midland Highway duplication between the Geelong Ring Road and Anakie Road. My child attends Kardinia College and was told that when the school was operating as Morongo Girls’ College a female student was accidently locked in the cellar on last day of term and died because no one knew she was there. It is also said that a ghost of a girl is seen in the Medical Centre. Just curious to know if this is true. This is an interesting one! I’ve never heard of a ghost story associated with Morongo so I conducted a small survey. My sister (Morongo late 1990s) hadn’t heard the story and wondered if it might have been made up for the “benefit” of the Kardinia kids. My brother (Kardinia early 2000s) thought the story sounded vaguely familiar but couldn’t add more. My daughter (recent Kardinia alumni) thought she had heard an “old wives’ tale” but wasn’t sure, however she could confirm the presence of a cellar beneath Main House. She has been in it and lived to tell the tale (they were looking for sites to film). My boys (current students) haven’t heard the story at all…although there may now be some questions asked…I’ve also had a Google and a look through TROVE and can’t see any sign of a student dying on campus at any point, however I haven’t looked for deaths amongst the previous occupants prior to it becoming a school. I'll let you know if I find anything else! Thanks !! I will pass this onto my daughter who is a current Kardinia student, she was the one who came home last week talking about it. She said that a teachers child was sick one day and had them in the medical centre with them and they kept asking why is there a girl sitting in the corner, but the teacher said there is was no one there. She said she has seen where the cellar is but it is locked with a chain, she also said it is a little creepy in the classrooms near the cellar, this was before she was told about the story. Yes do keep me informed, she asked if I had found out anything. Interesting! I'd love to know who the teacher was! I'll let you know if I hear anything else. To the break and back and a broken back! Branching out - Woodbourne No. 2 - no rush! Branching out - Woodbourne No 2: where is it now?